Early this month The Conference Board reported the fourth quarter 2016 Measure of CEO Confidence. The fourth quarter reading was reported at 65 and is the highest reading since the first quarter of 2011. Readings above 50 indicate more positive than negative responses. "CEOs' assessment of current economic conditions was considerably more optimistic, with close to 60 percent saying conditions were better compared to six months ago, up from just 17 percent last quarter." "Business leaders' appraisal of current conditions in their own industries also improved significantly, with 46 percent stating conditions in their own industries have improved versus only 21 percent in the third quarter." "CEOs' short-term outlook for the U.S. economy also improved markedly, with approximately 67 percent expecting better economic conditions over the next six months, up from 25 percent last quarter." "The outlook for their own industries was also more favorable, with 58 percent of CEOs anticipating an improvement over the next six months, compared to about 23 percent in the third quarter." Global expectations are more mixed as discussed in the release. 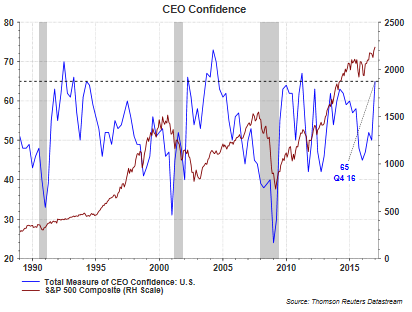 This spike higher in CEO Confidence is similar to other sentiment and confidence measures that have been reported over the past few weeks and highlighted in a recent blog post. The widespread improvement in sentiment is a tailwind for the economy and equity markets. The key will be whether or not positive confidence and sentiment readings translate into actual increased economic activity.